Toilet Paper Should Be My Choice, Not My Toilets! Home / Sarasota Plumber / Toilet Paper Should Be My Choice, Not My Toilets! Soft, thick toilet paper, ahh. Everyone would rather have the softest toilet tissue to use. But a lot of people can’t use the toilet paper of their choice, because their toilet won’t flush it down or it stops it up. Toilet paper has been around a long time. China had it centuries before Europe in 589 AD. In 1393, an official of the Ming Dynasty recorded that 720,000 sheets of toilet paper were produced for the Imperial Court. The higher class of people in Europe, used a tersorium. This was a sponge mounted on a stick. If water was not available they used stones, three stones was the norm. Paper remained expensive and uncommon until industrial production greatly reduced costs in the 1800’s. 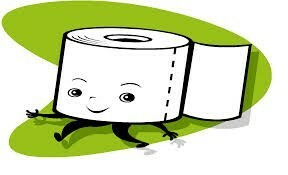 The first patent for roll based toilet paper was in 1883. Only the wealth people used paper. Others used rags or plant material. In 1975, the American Broadcasting Company banned the phrase toilet paper and required it to be called toilet tissue. The Farmers Almanac has traditionally been produced with a hole through one corner so it could be hung on a nail in an outhouse, so its pages could be used. I used to hear people say that was what the Sears Roebuck catalog was for, as well as corn cobs. Maybe you have seen the commercial of the college kids buying beer and toilet paper. They get to the check-out and find they don’t have enough money to buy both, so they don’t buy the toilet paper. then the bag boy asks them if they would like paper or plastic and they both reply in unison, paper. I get a grin out of that. So does your toilet not let you flush the soft kind of paper you enjoy? Does your plumbing system stop up when you use thick toilet paper. Do you have to be cautious of the amount of paper you flush at once? You don’t have to be a prisoner to your toilet. Don’t let your toilet or plumbing system mandate your comfort level. Wimpy’s Dependable Plumbing has the answer to your toilet paper issues and your toilet blockages. Call 941-322-1911 or schedule your estimate on line at Loveyourplumber.com We are the Plumbers for the Sarasota, Bradenton area for people who want to use thick, soft, toilet tissue.